Robert Villones You are capable of doing anything you set your mind to! Get it done! You are capable of doing anything you set your mind to! Get it done! Robert Villones You are strong! Flex your muscles and get it done! 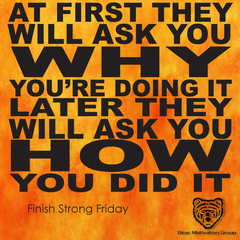 Finish strong Friday! You are strong! Flex your muscles and get it done! 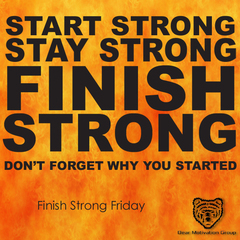 Finish strong Friday! Robert Villones Fight to the finish and have an awesome day! 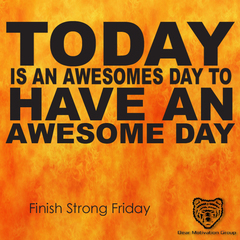 Fight to the finish and have an awesome day! Robert Villones One lap is all you need to make up the difference between winning and losing the week. Friday is the last lap! 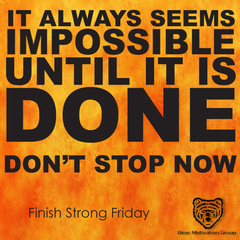 Finish Strong! One lap is all you need to make up the difference between winning and losing the week. Friday is the last lap! 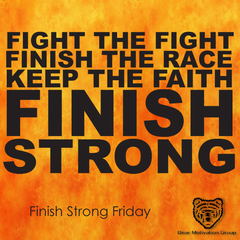 Finish Strong!